The Crawdaddies who hail from the Baltimore and Washington, D.C. area describe themselves as a band that plays Cajun and zydeco rhythms with cool Swing grooves, Country, Rock and Soul. If you listen to their CD "Spice It Up" you get the sense very quickly that their description is quite accurate. Any band that can record a cover of The Monkeys'' "Last Train To Clarksville" and make it sound like it was born on the bayou can't be that bad. The Crawdaddies are a seriously talented band. Although their music is mostly a blend of Rock, Reggae and Blues their use of the accordion is very effective in adding a hint of Cajun and zydeco flair to their sound. The well-rehearsed and polished Crawdaddies are: Kraig Greff (accordion); Jay Corey (vocals, acoustic guitar, rubboard); Chris Huntington (electric guitar, vocals); Conrad St. Clair (bass, vocals); and Jay Edwards (drums). 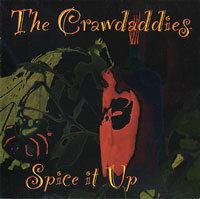 The Crawdaddies' "Spice It Up" is another one of those eclectic recordings by a regional band proving that there is great zydeco talent northeast of the Mississippi. There are several memorable tracks among the eleven featured including the bluesy feeling of "Alberta," the country sound of "Betty Says," the push pump of "Habit Forming," and the lively Cajun rhythm of "Pump That Thing." The members of The Crawdaddies play their respective instruments ferociously and their upbeat sound all seems to come together well and will leave you satisfied. But don't expect any hard-driving zydeco here. "Spice It Up" is more reggae and rock with a great piano accordion than it is 'les haricots.' The band's philosophy about their music is rather straightforward; "why not, it might just work." Well, for me the three-pepper "Spice It Up" works. You can purchase this CD online and learn more about this talented group of musicians from the beltway area on their official web site at www.thecrawdaddies.com.